Added by Indo American News on January 2, 2014. Bhagavatam and Krishna katha showered by Sri Ramanujam ji, disciple of His Holiness Maharanyam Sri Sri Muralidhara Swamiji. 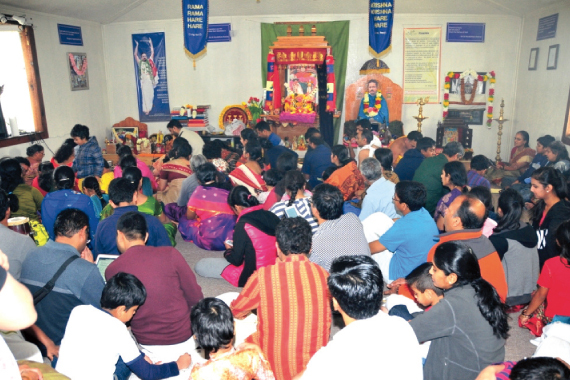 MANVEL: The daily evening shower of nectar in the Pearland area was the highlight of the 7-day Srimad Bhagavata Saptaha Mahotsava organized by Global Organization for Divinity (G.O.D.) from Dec 21-27. The nectar was the heavenly Bhagavatam and Krishna katha showered on all the fortunate listeners by Sri Ramanujam ji, disciple of His Holiness Maharanyam Sri Sri Muralidhara Swamiji. Sri Ramanujam ji is an excellent speaker, well-known for presenting deeply insightful concepts of Sanatana Dharma in an amazingly simple, clear and witty manner. This time round, his expositions of the various bhagavata charitras in Srimad Bhagavatam; his wonderful, lucid explanations of many subtle aspects of spirituality including how the many supposed inconsistencies of Sanatana Dharma fit perfectly into the beautiful, large canvas of the world; and his final day’s elucidation of Krishna katha itself, were all simply incredible! And the feeling it left in the listeners was truly beyond description – something which, like Divine bliss, can only be enjoyed and not explained in words! Which is exactly the purpose of Srimad Bhagavatam – it is meant to be drunk with relish, not chewed on. Those who had the fortune to listen to the discourses were indeed an immensely blessed lot. Srimad Bhagavatam shows the path of Bhagavata Dharma – which is essentially leading a life of joyous devotion to God by chanting His names, singing His glories, listening to His stories and serving Him and His devotees. And the Srimad Bhagavata Mahotsava was arranged to do just that. All through the seven days, during the day starting from about 6 am, Namadwaar Prayer House reverberated with the Mahamantra, with Tiruppavai, with Srimad Bhagavata parayanam, with kirtans of great mahatmas including Sri Jayadeva Ashtapadhis, and much more. 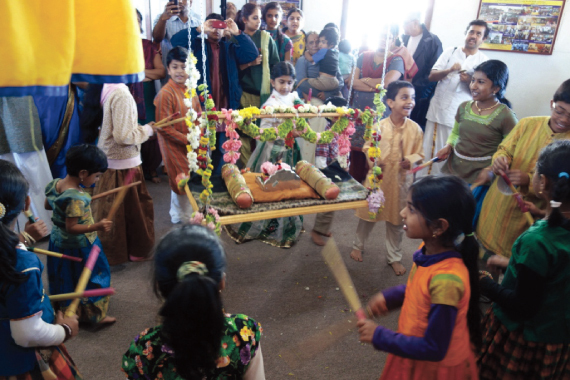 Special events on different days included – processions of Sri Premika Varadan-Sri Madhuri Sakhi (Lord Krishna-Sri Radha) on different vahanams (mounts) including Sesha vahanam, Garuda vahanam and Yaanai (elephant) vahanam; Krishna jananam and Nandotsavam; Govinda pattabhishekam when the Divine Couple were given a sacred bath (abhishekam); Nikunjotsavam, Janavasam and Radha Kalyanam (wedding of the Divine Couple). For the Nikunjotsavam event, there were special music and dance offerings to the Divine Couple: a Carnatic music concert by Vidushi Smt. Rajarajeshwary Bhat, Smt. Uma Ranganathan and Kum. Keerthana Bhat; a Bharatanatyam dance performance to an Ashtapadhi by Kum. Suwetha Kalyan of Dallas; and the special offering of a song from G.O.D.’s upcoming Bharatanatyam dance ballet production, “Radhe..Radhe..” by Kum. Surabi Veeraragavan. On the final day, on completion of the parayanam of the 18000 slokas of Srimad Bhagavatam, 108 Hanuman Chalisa was chanted followed by Bhagavad Gita 12th chapter, Vishnu Sahasranama and finally the concluding Anjaneya utsavam. In the evenings, preceding the daily Bhagavatam discourse by Sri Ramanujam ji, many local artistes offered their talent to Bhagavan Sri Krishna and Sri Radha Rani in a devotional cultural segment called ‘Krishna Bhakti Samrajye’. The highlight among these performances was a Hindustani vocal concert by Pandit Suman Ghosh and disciples. Other performances, which featured the compositions of His Holiness Sri Sri Muralidhara Swamiji, included Carnatic vocal renditions by Smt. Neela Chakravarthy, Smt. Sridevi Josyula, Kum. Shilpa Sadagopan, Students of Smt. Rajarajeshwary Bhat led by Kum. Keerthana Bhat and Smt. Viji Vishwanathan; a sangeetha upanyasam on Sri Krishna’s navaneetha chora lila by Smt. Uma Ranganathan; Veena rendition by Smt. Lakshmi Srivaths; Violin renditions by Sri Mahesh Iyer, Maya Iyer and Kishore Iyer and by Keshav Srivaths; and classical dance performances by Smt. Sravanthi Modali, Kum. Srividvatha Sridhar, Kum. Vathsalya Senapati and Kum. Suwetha Kalyan. The entire week-long event was attended not only by people from all around the Houston area, but also by over 100 visitors from around the USA including Boston, California Bay Area, Redding-California, Chicago, Dallas, Detroit, Atlanta, Richmond-Virginia, New Orleans, New Jersey and other places. G.O.D.’s next major event in the Houston area will be a Bharatanatyam dance ballet production titled “Radhe.. Radhe.. – A Story of Love for the Supreme” – presenting the story of Sri Radha Rani through dance, which will be presented on March 15, 2014. Global Organization for Divinity (G.O.D.) is a worldwide organization that aims to promote peace, harmony and universal love amid cultural diversity. It is involved in several spiritual, cultural and social activities across the world and in several cities in the USA, including the Houston area. 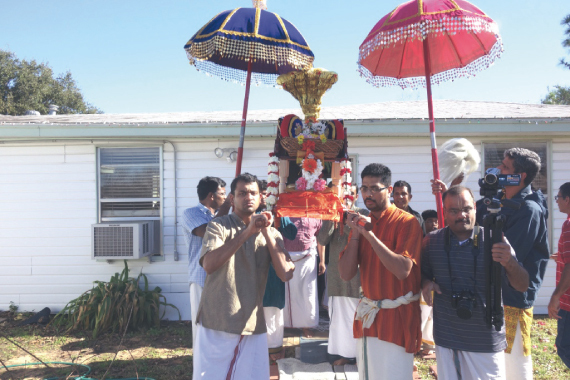 Established by G.O.D., the Namadwaar in Houston is the first prayer house of its kind in the United States, where the divine names are continuously chanted. It is one of about 20 Namadwaars (Sanskrit term meaning door of the Divine Name; “Nama” – [divine] name, “Dwaar” – door) across the world, and part of G.O.D.’s worldwide initiative to strive towards universal peace and harmony through individual inner transformation, a result of chanting the divine names. For further information about G.O.D. or Namadwaar, call 281-402-6585, or email houston.god@godivinity.org or visit www.godivinity.org.